The newest most ingenious way of disinfecting your CPAP hose, from the inside with no chemicals. Powerful germicidal UVC light destroys germs and pathogens in under 60 seconds and stops formation of biofilm build up. Combine the Lumin and Bullet for the quickest way to ensure clean breathing all night long. Disinfect your CPAP equipment in minutes, no delays or wait times to use. Safe for patients with respiratory disorders. UV light will disinfect up to 99% of harmful bacteria, pathogens and fungi that can cause infection and illness. UV light is also the safest disinfection option on the market, there is NO HARMFUL OZONE. Purchase separately or bundle with the Lumin. UVC light is well known around the world for its disinfective properties. This science is used in operating rooms, dental facilities and even to sanitize drinking water. Your hose environment is a warm, moist breeding ground for germs that may cause illness. Washing alone doesn't always ensure the cleanest hose. Lumin Bullet gives you peace of mind that harmful germs have been safely and effectively eradicated from your CPAP tubing. Unlike other methods, ultraviolet light is the fastest disinfection method available. In under 60 seconds, your hose is completely sanitized and ready for use. No waiting period, no delays, and no harmful gas or chemicals. Your CPAP hose carries warm and moist air from your CPAP machine. After nightly use, your hose becomes a breeding ground for bacteria and mold. In less than 5 days of use, your hose is already starting to develop a layer of biofilm on the inside of your hose. Using the Lumin Bullet twice weekly on your hose prevents the development of a biofilm insuring that your hose remains slime free. The Lumin Bullet is rechargeable with a micro USB cable to make it easy and convenient to use. One charge lasts for 30 uses. Lumin Bullet was designed to work with all brands and styles of CPAP hoses, including heated tubing. Other CPAP cleaners attempt to conceal their use of ozone by calling it "activated oxygen", a toxic gas that FDA strictly cautions against use in a home. Inhalation of ozone can cause pulmonary edema. Because ozone can take several hours to degrade, using an ozone producing device in a home has risks. Lumin, by contrast, relies on ultraviolet light to disinfect. UV light involves no toxic or harmful gases and is extremely fast, effective and safe. 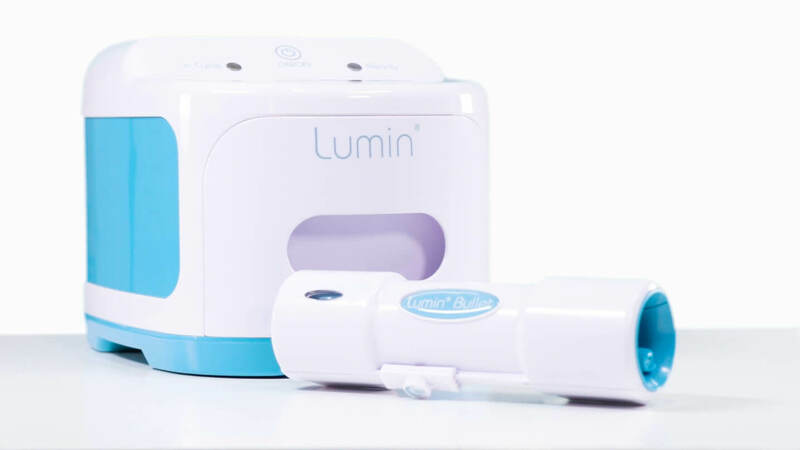 Lumin and Lumin Bullet are the safest and healthiest way to disinfect your CPAP accessories.